Begin the list with the heading ‘Bibliography’ on a new page at the end of your work. Use double line-spacing and a hanging indent (approx. 0.75 cm or 4-5 spaces). If a DOI or URL needs to be broken across a line, break before a single slash or punctuation mark. 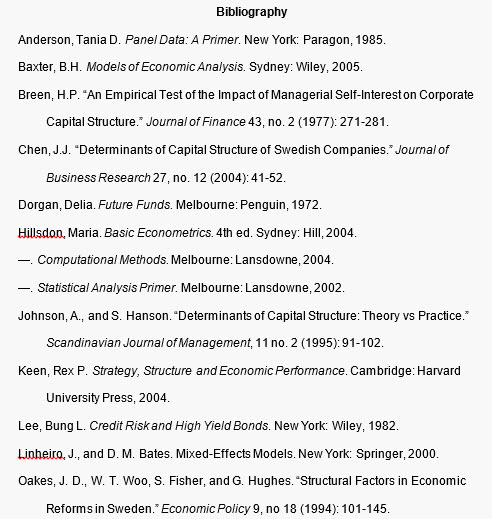 Include an entry for every source you have cited in a note. Do not include entries for sources you have not cited, however relevant. Alphabetise entries by author’s last name (which begins the entry). Use a long dash (or three hyphens) to stand for a repeated author name. If you have more than one entry with the same author, list alphabetically by title.